A new study suggests that a genetic switch that causes latent HIV inside cells to begin to replicate can be manipulated to completely eradicate the virus from the human body. Cells harboring latent HIV are "invisible" to the natural defenses of the immune system. During infection, the DNA of HIV makes its way into the host cell's nucleus and integrates itself into the host genome. The Tat gene circuit is a key piece of HIV DNA that controls the HIV gene transcription and activation. When activated, it initiates a takeover of the cell's machinery to churn out new copies of the HIV virus, which eventually burst from the cell and infect neighboring cells. 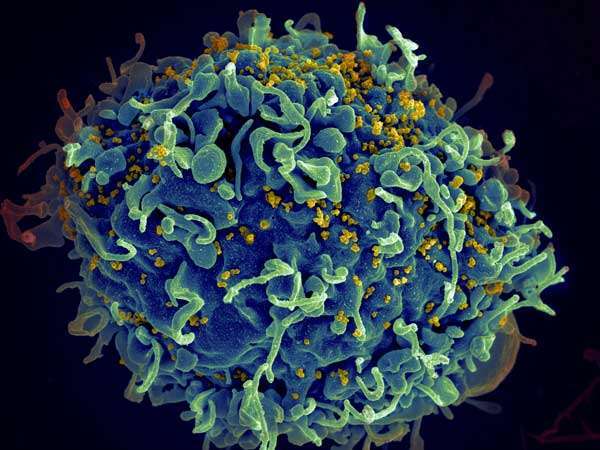 HIV-specific immune effector cells kill cells infected with HIV, but only when the cells are being used to produce more of the virus, meaning that the Tat gene circuit is switched on. In cells that are latently infected, the Tat gene circuit is off, and the cell goes about its normal business all the while harboring quiescent HIV. "By targeting the Tat gene circuit with drugs or small molecules to activate it, we would be able to cause latently-infected cells to start producing more virus, and then they can be destroyed by the immune system," said Jie Liang, the Richard and Loan Hill Professor of Bioengineering in the University of Illinois at Chicago College of Engineering and a lead author of the paper. So far, there are no drugs successfully targeting this circuit. People infected with the HIV virus can live relatively normal lives with exceedingly low or even undetectable viral loads thanks to powerful antiretroviral therapies that work to suppress viral replication. But even in people where the virus is undetectable, it doesn't mean it's completely absent. The HIV virus can hide in cells in an inactivated state, meaning it isn't actively replicating. "It is extremely difficult to flush latently-infected cells out of their latency," Liang said. Techniques developed to reactivate latent HIV-infected cells so that they become susceptible to the body's natural immune response or to drug therapies have had mixed results—mostly because the technique, known as "shock and kill," relies on a class of drugs called HDAC inhibitors that come with severe adverse effects. "We need to better understand the mechanisms that regulate HIV latency so we can identify new opportunities for intervention and develop better drugs that can either lock viral particles in a latent state, or kill latent cells, or both," Liang said. The Tat gene circuit has a random probability of being active or inactive, and the switch from inactive to active can happen spontaneously. "In HIV-infected cells, reactivation of the Tat gene circuit is still a very rare event," Liang said. "Using different models and algorithms, we were able to accurately map a 'probability landscape' of the cellular reactions that can impact Tat gene circuit reactivation, and our results suggest new ways of targeting latent cells that may lead to the eradication of the HIV virus from a host," Liang said. Liang and his colleagues identified ways to manipulate the Tat gene circuit so that the "shock and kill" technique would be more effective. They also looked at a "block and lock" strategy, where latent viral particles are locked into latency by permanently blocking activation of the Tat gene circuit. "Our results suggest that by controlling HIV latency through manipulation of the Tat gene circuit, effective therapeutic strategies can be identified that would one day provide a cure for HIV," Liang said.